12 and 13 advance, 13 cutting in towards the 12 and drawing their defender in. 11 loops around, planning to enter outside 13. 12 miss passes to 11. 15 should have advanced from behind the 13 and up. Think about what could happen if the move needs to be cancelled, what will happen following the move if we pass the gain line and if we are stopped at the gain line. Run this unopposed, before adding pressure. Run this move with pressure as the team gets better. Think about where you will use with move on the pitch. Think about using cones to mark out starting and target points. Allow players to cancel, but if they do cancel, what are their options? Players heads need to be up, a move should be a fluid attacking strategy. Think about player foot-speed, do the players need to be running flat out all the time? 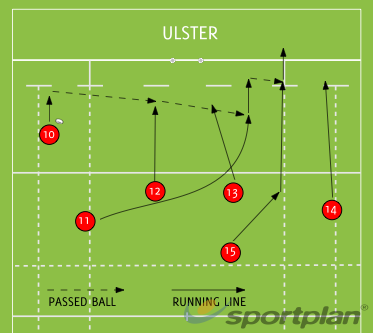 The pass between the 11 and 15 should be as close to the opposition defensive line as possible, timing is everything. Note: Feel free to experiment, to change things a little. Create your own version of this move, if you feel it needs a change, then make it! Think about the following: use changes in pace to draw defenders out of position, attack space at pace, there is no point in executing a move too far away from the opposition defence (they will simply watch it and it will have no impact), running lines are vital to drawing defenders away and attacking space, communication must be at the heart of the call and the attack (keeping in mind that the move can be canceled at any time), heads must be up (players must play what they see not what they hope will happen), and think about all of the outcomes e.g. what happens if we get through, if a ball is intercepted, if a player goes into contact with the ball etc. Select moves that suit your player and team profiles, there is no point in lifting a move you watched in the Six Nations, if your team simply don't have the skills to execute the move as close to the defence as may be needed. Think about the opposition, and give your players the ability to run moves that can be remembered, there is little more disheartening than to hear a back-line player ask their teammate during the game, how do we do that again? Think about where you will run a move. A good idea is to map out the pitch, and to provide your players with a list of moves that can be executed in the different areas. Don't be afraid to have a classroom session, where you go through the moves, and possibly ask the players to draw them out on paper. Try to give your team a general attacking framework, rather than a large collection of moves. I've tried to develop a number of moves, each time making changes that will allow your players to progress with a significant library of attacking moves based on one core move. For me, if you can give your players the ability to create moves in an instant, then you're more likely to have a team that can adopt to what is actually happening in a game, rather than a team that simply runs a move in hope. Get the basics right, don't forget to focus on the skills of passing, catching, running onto the ball, carrying the ball in two hands, speed of running with the ball etc, before you start asking players to execute backs moves. A backs move can be a strange thing, when done well it's a joy. When done badly, it's a shocking waste of time, and possibly territory! Therefore it is vital that your players can execute the basics before moving to a backs move, remember - do the basics well and your team won't go far wrong! Have one player call the move, but allow all players the ability to cancel the move (within reason), and to be creative based on what they see. All of the backs need to keep their heads up. While the move is rehearsed, the outcome or what might happen during the move is not guaranteed! An opportunity may present itself, or it may all go a little wrong. Just because we can, doesn't mean we should. There has to be a reason for a move e.g. is there an opposition player that we wish to attack, or is there an opposition player that is ball watching or can be drawn out of position? If the ball is wet and the wind if howling, do we really want to be firing high speed miss passes or taking unreasonable risks, players need to play the conditions. DON'T, please don't - use moves in place of attacking creativity and flair. Try to use video to have a look at moves focusing on what went well, what needs to change, what we missed when running the move etc.